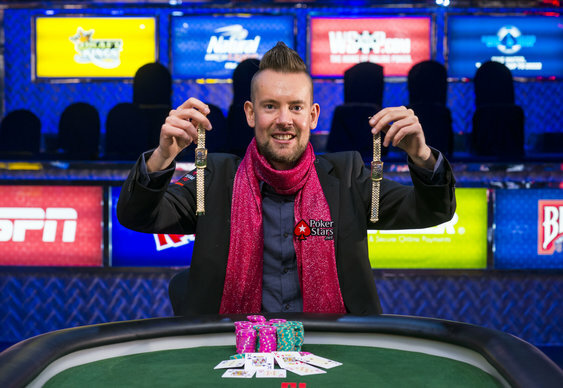 The World Series of Poker has crowned its first double winner of 2014 after George Danzer took the honours in event #38: $10,000 Seven Card Stud Hi-lo. The German had already won the Razz Championship event earlier this month and boosted his bankroll by $353,696 after beating a small but stacked 134 runner field chasing stud glory. 13 players returned for the final day's action with the familiar figure of Todd Brunson the first to hit the rail followed soon after by recent Phil Hellmuth conqueror, Ted Forrest. Once ESPN's Norman Chad returned to the commentary box after busting in tenth Danzer really hit his stride, eliminating both Richard Sklaar and John Monnette in the same hand. Aussie Jeff Lisandro fell just short of WSOP bracelet number six, departing in fifth place. His vanquisher, Brian Hastings followed in fourth at the hands of Danzer. After Calvin Anderson exited in third it was left to former Main Event runner up John Racener to try and stop the Danzer double. It was to be another runner up finish for Racener though who couldn't overturn a hefty chip deficit and eventually succumbed when his queens were beaten by Danzer's kings.